Djia Mambu interviews Mariama Sylla, producer and co-director of the film “A Single Word” (with the late Khady Sylla). SOURCE: Africine.org. Translated from French by Beti Ellerson. 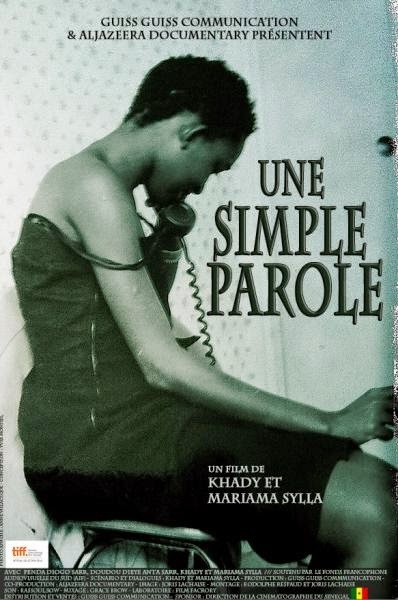 "A Simple Word", premiered at the Toronto International Film Festival (TIFF), the documentary by the Senegalese sisters/filmmakers, Mariama and Khady Sylla, draws a picture of their traditional oral culture where their grandmother remains one of the last guarantors of genealogical memory. Khady Sylla, who died in October 2013, left with us a tribute to the ancestors and those who have gone. It is the seventh collaboration with her younger sister, who considers this the most accomplished of their work. Djia Mambu: Two Senegalese sister filmmakers, this is rather rare in this realm? Mariama Sylla: I started working with my sister at the age of 17; she is the one who trained me and introduced me to cinema and scriptwriting. The person I am today is the result of this long journey with Khady, the first-born of our family. I am the youngest and she and I often laughed about being at these two ends, despite the difference in age and education, we were able to come together. DM: How did you come up with the idea to make a film paying tribute to your ancestors? MS: The idea for the film came one day when, while sitting on a mat next to our great grandmother, her voice broke the silence of the evening sunset and the purple twilight. She sang of her ancestors. Her slightly husky voice, the emotion that it carried, moved us deeply. Though we were not able to record these words that came from the depths of time, we were satisfied with listening to the voice of this centenarian with whom we had woven so many ties. It is from this moment that we had a desire to make a film about the oral tradition but seen from the perspective of our family, because we had realised that being of a generation of the written word, that this manner of relaying the word had escaped us. DM: Oral transmission is at the heart of your culture, and it is your grandmother Penda Diogo Sarr who is the guardian. How did you manage to bring it to the screen? MS: We filmed several takes as Penda Diogo Sarr taught us the words. We asked her to teach us the foundations of oral culture. She was very happy to do so, patiently repeating the words of a verse about three of our ancestors. Our grandmother lives simultaneous disappearances, that of her own imminent person because of her advanced age, and that of the world that witnessed her birth into the world of the Wolof peasantry. And that is why every time she meets her grandchildren, this meeting is highly emotional. All of the imperceptible emotion that you see in the film comes from this sense of loss. "A Single Word" is not an ethnographic film about speaking, but it is rather a portrait and a questioning of the world. MS: Seen implicitly, read between the lines of the film, is this elder, in the twilight of her life, trying to convey that which risks disappearing with her. That is why we chose the simplest images as possible, in fusion with the bodies. This vision enabled us to film our ancestor while appearing in the film as secondary characters and as spectators. DM: In your view, what is the real issue at stake if the oral transmission of culture and heritage disappears in Senegal, Africa, and in the world? MS: The spoken word for the Wolof peasantry is the vehicle of all knowledge. Speech travels through time. The Wolof is often perceived as a person of the word, master of the oratorical art. Our grandmother Penda lived during colonisation at its most difficult moments: forced labour, the conscription of soldiers... She lived during independence, the rule of the new elites, and the gradual hegemony of the written word over oral tradition. She lived through the gradual disappearance of this world. The spoken word defies death and oblivion. Presently, as a generation of the written word we have come to realise that the spoken word has eluded us through our existence as Senegalese women educated to master the word by writing it down. The disappearance of the spoken word is having a great impact on our lives not only in Africa but also for all humanity. MS: In our opinion, all the crises in the world result from the fact that we live in a silent, nebulous world, where the notion of dialoguing, which includes sharing and talking to each other, becomes obsolete. And then we rely on Facebook and Twitter as a stopgap, as a means of communication--at the same time walking by ones sister in the morning without greeting her. DM: Did the recent passing of Khady in any way influence the ending of the film? MS: The passing of Khady greatly influenced the final voice-over in the film but the visual editing is the same, as we had completed it just before her death. There are two voices in the film. The first is Khady’s, which was done in her presence, and the second is mine, which I wrote while finalising the film. I went through a moment of shock and anger, then slowly, the phrase in Césaire's work Notebook of a Return to My Native Land was constantly in my thoughts, and all this anger turned into a desire to write about my sister, to tell her a final goodbye, and this is how my voice was laid down in the film. DM: As the film screens in the cinema houses of Senegal, people will also view Khady's final work. What message from her will you give them? MS: Khady often asked this question: "What happened to us as human beings, when Facebook and Twitter are rapidly replacing the ties created by speech, family and friends?". I ask this same question to the filmgoers and those who will read this interview, so that the followers of this virtual world can one day respond to this question.